Instead of printing receipts, I want to allow customers to enter their email address and have their receipt emailed. Is this possible? /Box office & Day of event /Instead of printing receipts, I want to allow customers to enter their email address and have their receipt emailed. Is this possible? When you are using the POBO and DBBO versions of the box office, you will see the option to adjust this after you enter your settings from the box office. 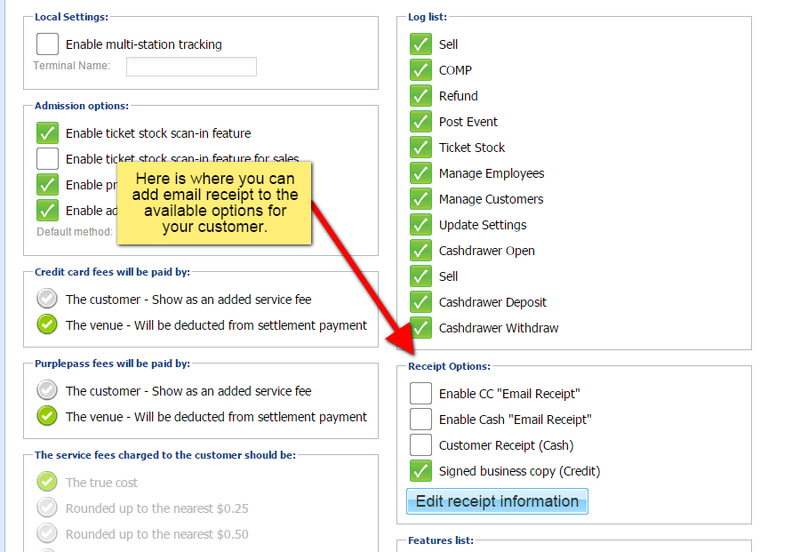 There will be “Enable Email Receipt” check mark box for both cash and credit. NOTE: By default this will already be selected. How can I find out how many people have entered the event? How do I view sales stats by each terminal? Can I use my own merchant account through the box office? What methods of payments can be accepted through the box office? Am I able to sell other things through the box office like merchandise or concessions?